Darko’s first solo-album, Apocalypso, was released in 1997.The 'Dancing Bear' record company decided to mark it’s 20th anniversary by re-releasing it as a double vinil album, and a luxury CD box-set with bonus material. This gave Darko the idea of giving a concert to celebrate 20 years of songs and musical creation, which in turn gave birth to the 'Apocalypso Now’ project. Eight musicians were involved : Isabel on violin - Duco on piano, accordion and ukulele - Igor Pavlica on trumpet, plus four musicians from the new Zagreb music scene : Roko Crnić on bass and drums - Silvio Bočić on drums, guitar and bass - Miro Manojlović on percussion and vibraphone - and Ana Kovačić on tenor saxophone and synth. Working with a formidable backstage team they put together an anniversary show which mesmerised the 10,000 strong Belgrade Tashmajdan audience, and the crowd of 15,000 focused on the main stage of the Zagreb INmusic Festival. Darko Rundek’s concert in Belgrade’s Tasmajdan stadium was large, lavish and unforgettable. Nearly 10,000 people were on hand to witness the writing of this important page in the history of former Yugoslavia states pop culture. 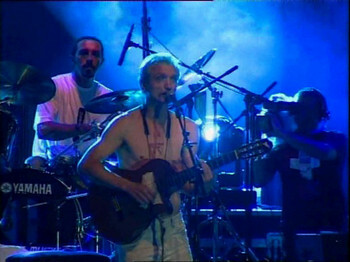 Rundek came on stage surrounded by excellent musicians for the opening song, Transit. With the first notes of this song the audience was transported into a special atmosphere which remained until the very end of this major artistic event. Each rich opus from Rundek flowed into exceptional musical performances across the stage, all set-off against the conceptual video being streamed onto the vast LED screen behind the band, to the delight of the 10,000 strong Tas crowd. The songs Jorgovan and More announced our departure on a rich and exceptional journey through the musical styles and melancholia of varying landscapes. Rundek and the band even took the audience to Cuba, then on through the incredibly undulating sounds of the song Indijska, where the band demonstrated its dedication to perfection. As Ruke was played, Tas became a dance floor. Strajk reminded us of the realities of today’s world. The sky was painted with Mediterranean fireworks during Carmela, and the opening bars of Apocalypso produced an explosion of joy. Rundek led the audience from one corner of the world to another, through the pains of love and social injustice. And at the end of this beautiful concert, as an encore, he gave us Sejn, which has spanned the generations since people first discovered and fell in love the band Haustor. At the end, ovations, hugs and kisses like those between old friends ; the Belgrade audience and Darko Rundek. About 500 Brodians had a serving of art that one rarely gets. Darko Rundek, in good humour, briefly welcomed the audience and began the performance with a huge helping of creativity. Soon afterwards, with the first notes from Isabel on the violin and the highly skilled Bosnian multi-instrumentalist, maestro Duco, Cargo took us far from everyday life to a place where man is free from prejudice, open to the world, laughing and angry, bent under the weight of stereotypes, and made our emotions boil. Yes, Rundek's music isn't cheap, but pulsates like the beat of a little man with a big heart. It invites us to contemplate, brakes the barriers around tolerance, and makes us love each other, care about others, and "open our windows" to new thinking and new worlds... that's why it was important to see so many young people dancing in the audience. With a mixture of older songs like Ruke (Hands), Hiawatha, Uzalud pitaš (In Vain), Ay Carmela, and new ones from the album Mostovi (Bridges): Ne zaboravi me (Dont Forget About Me), Džaba (For Nothing), Mostovi (Bridges), Trio created an intimate atmosphere and brought the audience to an almost hypnotic state, because that's where their live music brings us. Violin player Isabel came across as the most sympathic (and the most special!) member of Trio. She received the greatest ovations, and her virtuoso solos and sentimental approach to each song gave them a special charm which is hard to describe. 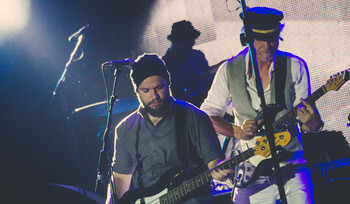 The structure of the band and their minimalistic approach make Cargo a powerful brand at the highest international level. The songs are driven by emotion, performed from the heart, and the interaction between the musicians on stage is full of friendship, respect and understanding. The pleasure of playing is omnipresent, and they deliver their soul to the audience. The ease with which they improvise is so damned adorable. After two and a half hours of musical meditation the audience left the venue in an unnatural calm, like after a good sleep, or a glass of good wine after a working week. In the space of three hours Darko Rundek delivered one of his best concert versions ever, fascinating by the ambition and ease of performance of a highly complex program. He also proved that as an experienced musician he is not afraid of risk taking, and whatever the concept may be he knows how to reach an audience and give them a top quality author's soirée. Dušan Vranić is the key collaborator in charge of the sound of the band (he plays percussion, keyboards, samples, ukulele and accordion). Isabel on violin fills the role of main soloist, and the use of sound processors significantly widens her sound spectrum; sometimes one would believe she is on electric guitar for example. The streamlining of the band has reinforced the engagement of the Trio and opened the way to fine instrumental nuances that we couldn't hear in the Orkestar. Of course, each musician has to give more and be more concentrated than usual; but the ease with which it is done demonstrates that this concept is a natural progression of Rundek and his collaborators rather than the pretentious choice of an “artist”. The songs from the new album with their intimate atmosphere and superb lyrics functioned impeccably before an audience of fans, but we were curious as to how the hit songs from earlier big band albums were going to function in the second part of the concert. The result couldn't be better. Like Pete Townshend of the Who, Rundek passionately led the story on acoustic guitar and vocals. Well known old favourites like Ena, Ruke or Apocalypso appeared in a new and more direct form. The audience was immediately on its feet for a great party, undoubtedly richer than the coming New Year's feasts. The Trio delivered the essence of every song, and even the most demanding and ambitious passages where done with pleasure and ease. 'I will move to Cuba,' croons Darko Rundek over a gentle Latin rhythm, with pizzicato violin and acoustic guitar. 'There are no big billboards all around, no-one is starving and there is no democracy.' Rundek is a craggy Croatian troubadour, now based in Paris. His band, the seven-piece Cargo Orkestar, can play anything from fractured funk to white reggae; from Balkan bluster to ambiguous ballads. The sound is spiced by Isabel’s soaring, proggy violin and fine brass. Drummer Dani Pervan is particularly good, holding a very disparate set of rhythmic approaches together with superb musicianship. The Cargo Orkestar’s sleazy, broken rhythms occasionally recall Rapture-era Blondie or Talking Heads. Wanadoo, his internet rant-chant, has the mad angularity of XTC and David Byrne. Rundek is a 1980s survivor himself, having led new wave band Haustor in old Yugoslavia, and many in the audience demand his old songs. Rundek’s subsequent work in the theatre, plus Parisian exile, have added depth and detail to the energy of his old modes, but he can still play the silver-haired, ravaged rock star, whipping off his shirt to reveal a skinny, pallid torso. He can sing, too, as slower numbers such as Senor reveal. The whole event is unpredictable, thought-provoking, highly musical, and a bit mad, just the thing to provoke a new Cargo cult.